The ever-changing seasonal canvas of our gardens provides an exceptional natural setting for any wedding, special event or meeting. 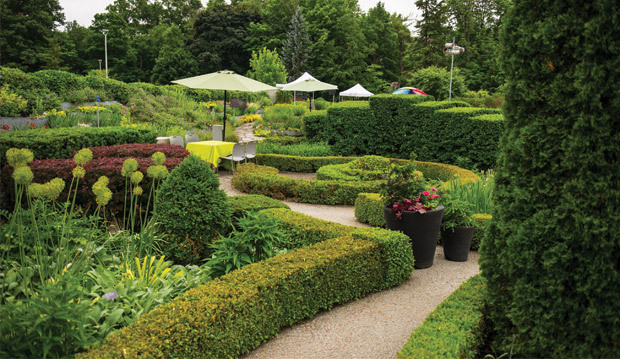 With magnificent views of our 17 award-winning themed gardens, the Toronto Botanical Garden’s contemporary LEED Silver Certified building offers a uniquely green venue for your special event. Our halls, studios and conference rooms – some with private garden courtyards and tranquil water features – accommodate a variety of functions, from intimate gatherings to gala events. Our select group of catering and event suppliers has been carefully chosen for their commitment to the environment, innovative creativity and unsurpassed dedication to helping you plan an event that meets your budget and exceeds your expectations. Conveniently located in mid-Toronto with easy access via Highway 401 or the Don Valley Parkway and ample free parking, the TBG offers a convenient escape from city life. Book an appointment to see for yourself why the TBG was voted by BizBash as Best New Venue in 2007.